In recent years, small farm crop production, including organic crop production, has grown substantially. In fact, according to usda.gov, the 2016 Certified Organic Survey — released Sept. 20, 2017 — showed an astonishing 13 percent increase year over year, 2015 to 2016, continuing a decade-long trend of double-digit growth in the organic sector. To maintain growth and create profits, small farms and organic operations need to utilize a compact tractor and mechanical implements in place of old-fashioned sweat and muscle. That means that it is important to identify the proper tools for preparing seedbeds, planting and managing weed growth, especially in an organic operation that must remain chemical-free. A few of the labor-saving implements that are ideal for a small crop-producing farm include moldboard plows, rotary tillers, field cultivators, seeders and drills. Each of these can be found as a three-point implement that is sized right for your compact tractor. Read on to find out how each of these will help you do more and grow more, whether it’s your vocation or just your avocation. Preparing the soil can be a multi-step process depending on your soil condition, soil type and what your overall goal is. In organic farms, weed control without the use of harmful herbicides is a primary goal with soil prep. The tool of choice is a moldboard plow. Moldboard plows have been around for literally hundreds of years. According to the Columbia Electronic Encyclopedia, the first patent for a moldboard plow was issued to Jethro Wood in 1814 with patent improvements in 1819. Today the moldboard plow has changed for the better — better steel and replaceable parts — but the purpose of the modern plow remains the same: to turn and break up soil, bury residue and control weeds. The moldboard plow turns or inverts the soil and buries weeds and crop residue deep beneath the surface, providing organic material to enrich the soil. Plows are simple tools that consist of a curved moldboard or bottom that rolls the soil, a replaceable share point that cuts the soil and a replaceable landside to keep the plow tracking parallel to the unplowed land. Some models feature a coulter in front of each share to slice the soil prior to being rolled. Typical moldboard plows are one to four bottom, requiring about 15 hp per bottom. Another primary tillage tool for seed bed preparation is a rotary tiller. Rotary tillers make seed bed preparation an almost effortless task. Tractor-mounted rotary tillers all have similar components: a gearbox, rotor and drive system. The rotor has C- or L-shaped blades mounted in groups of four to six per flange. A chain or gear-drive system is mounted on the side of the tiller. The drive system is powered by a gearbox that is in turn driven by the tractor power take-off (PTO). There are options to consider — forward or reverse, chain or gear, just to name a few. Reverse-till models are well equipped for small farming operations. In most cases, a reverse-till model leaves a more desirable seedbed, depositing weeds, residue and larger clods below the surface and finely tilled soil on top. In rocky soil, however, reverse-till units are not recommended. The reverse rotation brings rocks to the surface and significant damage from rocks being pulled under the hood can occur. The tiller drive system is another option to consider and is a matter of preference. Chains or gears both do exceptional jobs of transferring horsepower from tractor to earth. The big difference is in torque — the gear-drive produces slightly more torque but also requires greater horsepower, up to 23 percent more in some soils. Tillers require modest horsepower increases as they get larger. A typical 42-in. 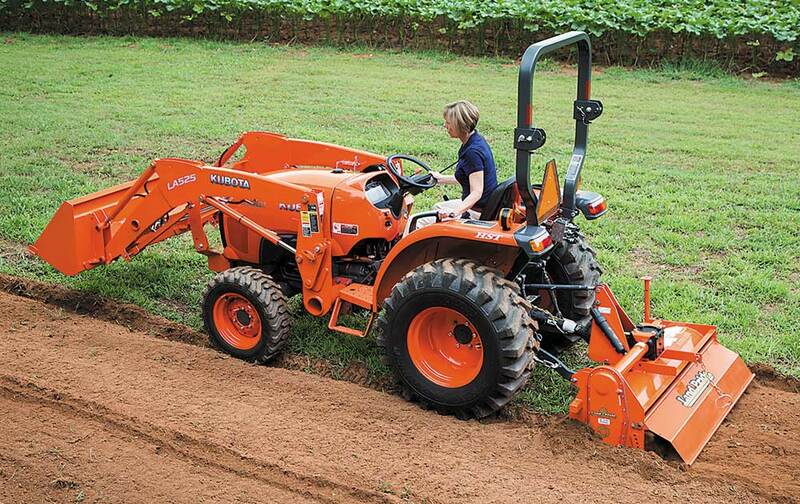 rotary tiller can require about 20 hp to operate at peak performance, and that can increase 5 hp with every 6-in. size increment. So, an 82-in. tiller can require as much as 60 hp to operate. After the initial tillage operation, it may be necessary for a secondary tillage operation, depending on how rough the seedbed is and how much residue remains. Tools for secondary tillage include a variety of harrows from disk harrows to spring-tooth harrows to spike-tooth harrows. Each of these harrows will help smooth plowed soil, reducing clods and smoothing the seedbed for planting. 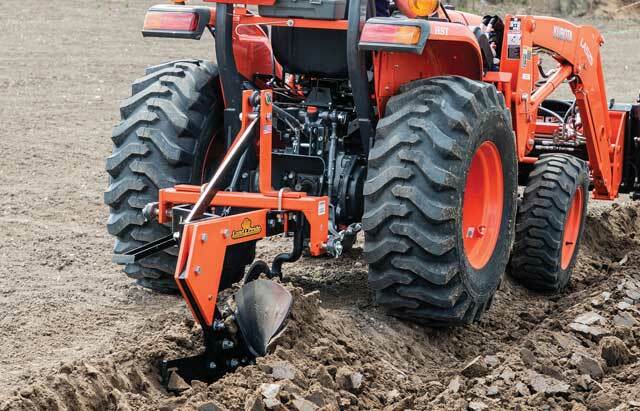 Harrows can be found for use on all sizes of compact tractors from 15 hp up to 100 hp or more. A popular secondary tillage tool that can be used throughout the growing season is a field cultivator. Field cultivators usually have two or three rows of S-shaped or C-shaped tines and can be used to break clods, loosen compaction or remove plant residue better than a harrow. Cultivators with adjustable tines allow users to set the spacing to match row spacing, allowing for use in post-germination to keep weeds under control and break crusted soil between rows. Typical field cultivators, in widths up to 96 in., can be pulled by compact tractors in the 25- to 50-hp range. Once the seedbed is prepared, there are several options for getting seed in the ground. The most economical are spin spreaders, which can be used when broadcasting seed for a cover crop or similar application. They are three-point mounted and usually have rudimentary calibration systems that rely on a slide gate near the spreading mechanism. Primary or all-purpose seeders are next in line and typically drop seed onto the prepared seedbed and press the seed into the soil with a packer roller. These precision-type seeders have multi-bushel seed boxes and metered seed cups to more accurately disperse seeds. Some seeders offer up to three seed boxes — a main box, a small seeds box for seeds like clover and a native grass box for “fluffy” seeds like brome — to accommodate a variety of seeds. Precision seeders like this can be calibrated more accurately than a spin spreader and have better germination rates due to the better seed-to-soil contact. Most accurate of all is a compact drill. Similar to a precision seeder, compact drills meter seeds for accuracy. The main difference is a drill uses an opener to create a small trough in the soil, then the seed is placed in the trough at a depth that can be adjusted on the drill for accurate placement. After placing the seed, it is covered and pressed into the soil with a press wheel. By accurately placing the seed in the ground and covering it with the proper amount of soil, germination is increased. Drills typically have larger seed boxes, adjustable openers and press wheels, and some have gearboxes to make changing seeding rates easier. On any type of seeding equipment, calibration is important to avoid over or under seeding. Various types of seeders have different horsepower requirements, but there are spreaders, seeders and compact drills on the market that fall between the horsepower ranges of many compact tractors. Spin spreaders typically require a minimum of 20 hp, precision seeders require 25 to 80 hp on average and compact drills require 40 hp or more. The largest limiting factor is the lift capacity of the tractor. Many of today’s compact tractor implements are well-suited for use on small farms and organic operations. From reverse-tine tillers that bury weed residue in one pass for soil prep to the seeding equipment that will be the beginning of a bountiful harvest, these products will help you be more productive. Visit your local tractor implement dealer and check out what’s available. 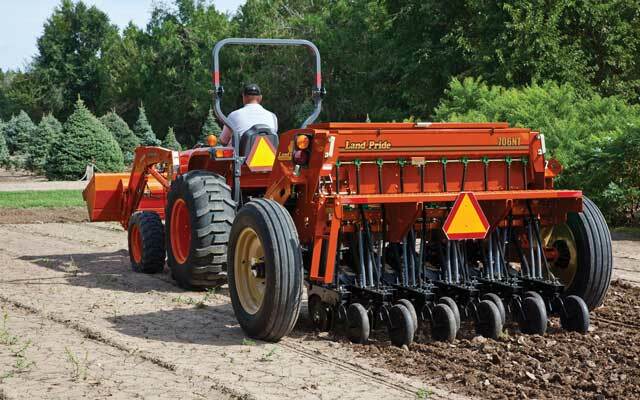 In addition to tillers and drills, many dealers stock harrows, field cultivators and other equipment that will enhance your crop-producing ability on small to medium acreage plots. Happy farming! Dee Warren is the marketing manager for Land Pride.